Made in 2000 Essex Boys is based on the murdering of drug dealers in 1995.The whole of the opening scene is full of generic thriller conventions . Firstly the title screen is creates a quite eerie effect , the white lines trickle down the screen like blood and this lends to the creation of suspense. 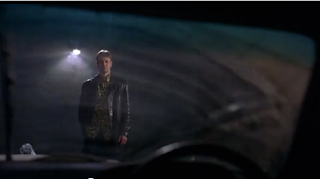 The first shot shows a young man (Billy) entering into a dark gloomy garage with an old car in it.Chiaroscuro lighting is used in this scene to create the feeling of suspense and nightmare. Chiaroscuro lighting is used in the same way in the very famous thriller The Third Man.The dingy old garage is rather small witch producers a somewhat claustrophobic effect witch adds to the grimness of the scene.The first bit of dialogue comes from Billy. This allows the audience to establish the Essex accent and learn a bit about him and start to relate to him. The Essex accent is also a cultural signifier . This point of view shot of the notorious criminal Jason is fantastic at portraying his significance and personality . Jason is being looked at through a dirty car windscreen, this represents his distorted nature as the windscreen is unclear of dirt. The audience can also learn there is a sense of arrogance about Jason due to his attire. The vibrant shirt is rather similar to that of Bill from Kill Bill who also is a 'bad guy' who is arrogant. The use of the small light adds to the significance of Jason as it has the effect of a spotlight which makes him stick out in the shot. 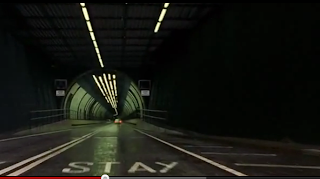 The shot of the Dartford tunnel is a cultural signifier which creates the typical thriller convention of the vanishing point. It builds suspense as usually in thrillers the vanishing point leads to a significant event.This is seen in the 1985 film Witness, as the young boy heads to the public toilet where a murder consequently takes place. The tunnel also resembles a barrel of a gun , which links in with thriller genre. 'STAY IN LINE' painted on the road is a sign that Billy should take notice of as he's being influenced by criminal Jason. 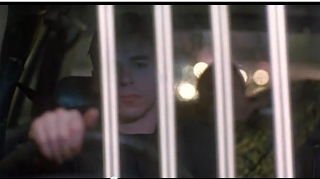 This medium shot of Billy and Jason in the car together is cleverly crafted to appear that they are both in jail. The reflection of lights in the tunnel onto the windscreen makes lines that look incredibly like prison cell bars,and the to characters are behind them. Jason appears to have his hands behind his head relaxing witch looks like he is relaxing in his cell. The also shows that Jason has been in prison before as he looks unfazed. You integrate media terms and close textual analysis well here, Jono, examining connotations and meanings intelligently. Good focus on specific details, and good reading of the text.